In 1964 the young people, under the capable direction and leadership of Mr. Xavier Michon, started one of the first Friendship Centres in Canada. In the beginning, they met in church basements and halls, until they were able to rent an old tarpaper shack on the corner of North Cumberland Street and Clavet in what was known as the city of Port Arthur. This became a “home away from home” for some 500 Native youth, many of them students from far northern isolated communities. Out of necessity, they were sent to Thunder Bay to attend high schools and for most, it was their first time being away from their communities and families. The Native Youth Club became their organization and outlet for activity. The Centre was where they grew to become the leaders of today. 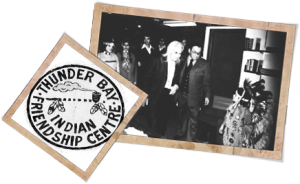 In 1968 the Friendship Centre incorporated under the name “Thunder Bay Indian Youth Friendship Society”. 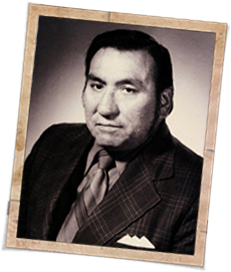 By 1970 the Native population had expanded a great deal and plans were already underway to build a brand new building at the same site. The property had been purchased for one dollar from a sympathetic company and eighteen Native youth began the building’s construction. In 1972 the Thunder Bay Indian Friendship Centre officially opened the doors of its present building at 401 North Cumberland Street – the first new Friendship Centre facility to be built in Canada. A base was provided for the establishment of core funding and capital programs with the Secretary of State. The Thunder Bay Indian Friendship Centre became the platform to establish long-term beneficial social and community development projects that addressed the basic needs of the family and demonstrated the contribution of the Friendship Centre to the Native community in meeting these needs. Over the years a variety of programs were established to meet the increasing demands on its services by the growing number of Native people migrating to Thunder Bay. Regular funding was secured for program assistance and various training programs were geared toward the Native newcomers to urban society, enabling them to “live in two worlds”. Since the Thunder Bay Indian Friendship Centre is located in the North Ward of Thunder Bay, it was physically removed from the South Ward of the city where the Native population had grown dramatically. Recognizing the needs, the Satellite Centre was established and officially opened its doors on January 15, 1988 at 704 McKenzie Street. In 1989 the Friendship Centre celebrated their 25th Anniversary. 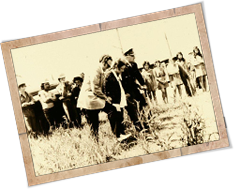 This was a time of celebration and a time to look back on one man’s dream of a special place which Native people could call their own, where they could gather and share common concerns. This was a time to thank the many dedicated people for their hours of sharing, caring and commitment to this organization. Since this time the centre has concentrated on developing a wide range of community-based and culturally appropriate programs and services to Aboriginal people residing in or migrating to the City of Thunder Bay. These programs and services address the distinct needs of Aboriginal peoples in the areas of justice, health, education, employment and training and relief of poverty. The Centre also participates in community development activities that promote cultural diversity and partnership development with other aboriginal and non-aboriginal agencies. As our programming expanded, so did the need for more space. In 1999 the Thunder Bay Indian Friendship Centre expanded by adding an addition to the existing building. Accessibility and façade renovations were completed in 2001. The Centre has always been a supporter of the Regional Food Distribution Association. In order to assist this worthwhile cause, we donated our building at 704 McKenzie Street to them in August 2007. Our Centre still continues to run a Food Bank on Tuesdays from 1:30-3:30pm at our facility. This organization is still in the growing stage and is ever changing in order to meet the needs of this community. In 2014 we celebrated our 50th Anniversary.